In an effort to reduce plastic waste, this year, edible liquid capsules produced from seaweed will help rehydrate London Marathon runners. The capsules, called Ooho, are produced by Skipping Rocks Lab, a ground-breaking sustainable packaging initiation established by Imperial alumni Pierre Paslier and Rodrigo Garcia. The 2019 Virgin Money London Marathon will witness the largest ever trial of Ooho after a successful trial at The Vitality Big Half. Lucozade Sport will be offered in over 30,000 Ooho capsules to runners at the Lucozade Sport station at Mile 23. The trial comes in the midst of rising concern about the quantity of plastic waste produced following the disposal of plastic bottles at mass participation races. Ooho is a flavorless, edible, and biodegradable membrane produced from seaweed that can be used to hold water and other liquids in a small “bubble.” The product is part of Skipping Rocks Lab’s goal to initiate the use of natural materials made from plants and seaweed to produce packaging with low environmental effect and help deal with the issue of plastic waste. Ooho is designed in such a way that it can be gulped down; however, if preferred, the team say that the Ooho material takes an average of 6 weeks to decompose in a natural environment—in comparison with plastic bottles which take more than 40 decades to break down. 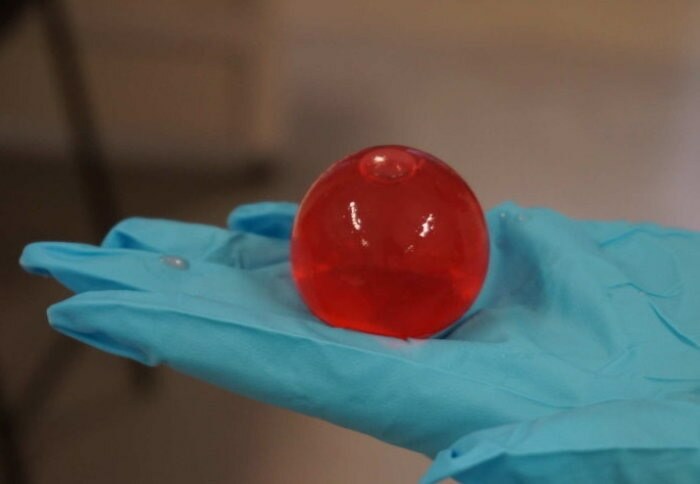 The researchers are testing Ooho as an alternative to small water bottles on the go, and also for fresh juices, condiments, and sauces used by fast-food restaurants, as well as for hydration in sporting events. Using Ooho, Skipping Rocks Lab wishes to enable customers to easily choose positively and deal with the abundance of plastic bottles, which are one of the most common things among trash present in the sea. They state that the key to the protection of the environment is changing the way the drinks are packaged. The group has created an industrial machine to make Oohos and it will have the ability to manufacture 100 Oohos within 5 to 10 minutes. Imperial Enterprise Lab has supported Skipping Rocks Lab, which was earlier based at the Imperial White City Incubator. At present, they have a team of 14 in their labs based in Bethnal Green.